Makers of the future at the heart – Comprehension and joy of success for all! Comprehension and joy of success for all! 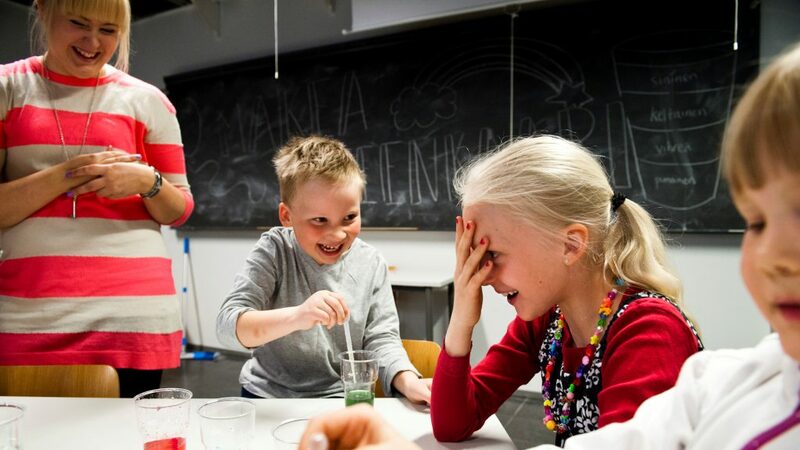 Since 2003, more than half a million children and youth – makers of the future – have participated in the collaborative science education operations of the University of Helsinki either physically or virtually, and in addition thousands of teachers, future teachers, researchers and international guests have participated. Most popular forms of engaging science education have been hands-on study visits to different ‘science labs’ operating in different faculties (6 labs), science clubs, science camps, science adventures, science birthdays, science theme-days, national and international StarT as well as virtual services1. Collaborative and engaging science education operates much like a learning community, where every participant (children, youth, instructors, researchers, teachers, future teachers, families, grandparents etc.) learns from one another through versatile interaction, wondering and working together. What do children and youth – the makers of the future – think of science, making science, the job of a scientist and different research topics (including climate change, artificial intelligence)? What kinds of questions do they have? What interests them? How to best confront different aged and different level children’s and youth’s know-how, promote various skills (such as critical thinking that is central in making science), curiosity, creativity, collaboration, interest towards science and studying science? Among other things, research concerning science education tries to answer these aims, and this blog focuses on looking at this from one viewpoint with the help of examples. The science education operations at the University of Helsinki are closely connected to the latest research on different fields of science and on education of them1. The latest research findings, for example on climate change and artificial intelligence, are processed or refined in collaboration with researchers and other collaborative partners, so that they would be suitable for different target groups. The operating models (study visits, science camps etc.) are connected to various research and development projects1. In the near future, the university’s research stations are also going to be exploited even more in the implementation of science education operations. Both basic research and applied research is carried out in science education on specific fields of science and in a multidisciplinary way, in national and international collaboration. The objects of research include the education in formal, non-formal as well as in informal learning environments. Research aims at answering to needs, for example to the current needs determined by the national core curricula. One aim is to refine together new solutions and pedagogical innovations on detected challenges with researchers and other collaborative partners (such as the business sector), and to promote the themes of the university’s strategy (e.g. sustainable development, digital competences). Research on science education includes both short-term or long-term research. In the future, it would be interesting to carry out research on how the science education started in early childhood supports learning of science and science-related study choices later on. Research on science education is carried out at the University of Helsinki mainly alongside teacher education in different faculties and in teacher training schools, and theses are written based on research. At the same time, researchers on science education and specialists for various positions are educated. When a new research and development project is started, most often one or more theses are written based on them. For example, some doctoral theses have been written in the past years concerning non-formal science education (e.g. Sakari Tolppanen’s doctoral thesis on non-formal science education concerning climate change and supporting gifted youth4 or Veli-Matti Ikävalko’s doctoral thesis on a relevant and non-formal learning environment, ChemistryLab Gadolin5). Papers on science education are written in Finnish and Swedish, in addition to English. The international scientific magazine, LUMAT, has been established to promote science education on math, science and technology. Research on science education is carried out actively in the various faculties of the university6. Below, some examples of research topics and theses related to these topics from 2018 are described. Scientific papers are on the making, based on most of these theses. An example of a research topic of science education operations is children and youth’s scientist image and supporting it through different science education activities. This topic has been studied in Finland only a little before. Here, scientist image refers to the impressions and notions that people have of scientists. Up until now, one study has been carried out as a master’s thesis7. 455 children and youth from ca. 20 science camps organized by the university took part in this study. With the help of the DAST test, the study aimed to find out the relationship between gender, age and the topic of the science camp as well as the scientist image of the camp participants. According to the study, Finnish children and youth have slightly stereotypical notions concerning scientists. The most typical stereotypical characteristics were working inside, male gender and different symbols and technological tools utilized in research. This study helps to understand how the scientist image of children and youth is formed and what things have impact on it. This also helps in directing the science education operations: it is possible to offer possibilities for youth to form a more realistic and versatile scientist image through e.g. scientist visits to schools etc. and hands-on activities. Interaction with the so-called role models can increase the interest of youth and also their self-efficacy towards the profession of a scientist, and increase the number of people studying at different fields of science7. Another example of a research topic of science education operations is collaboration between upper secondary schools and universities, and the relevance of the operations to upper secondary school students and university students. This topic, too, has earlier been studied only a little in Finland. Currently, several theses are being made in collaboration with upper secondary schools. Both young scientists and future teachers take part in research. Studying and understanding this matter is topical as there is new legislation in Finland, according to which upper secondary schools must co-operate with universities and offer their students a possibility to study within universities. The latest case study is focused on discovering the relevance of a collaborative course between upper secondary school and university from the viewpoint of an upper secondary school student and a university student8. Here, the aim was to understand the benefits of the course for each participant and to ponder on how these are aligned with the set aims, and to produce knowledge for developing similar models. The object of the case study was the course Global challenges that was organized in collaboration with the university and upper secondary schools in the City of Espoo. During the course, university students acted as instructors for the upper secondary school students, while upper secondary school students carried out phenomenon-based projects. The case study showed that a collaborative course can be organized in such a way that participants experience it as relevant on all the levels of relevance (individual, vocational and societal; cf. Figure 1). The experience of instruction for university students and vocational relevance were also seen as important. In addition to this case study, the relevance theory has been used in science education research to understand the importance of science camps and hands-on study visits from the viewpoints of children, youth, teachers and families9,10. Figure 1. Model of relevance in science education (Stuckey et al., 2013). Research on children’s and youth’s action competence in environmental issues was carried out last year as a master’s thesis12. The action competence is referred to as the ability of an individual to act on behalf of an issue. Environmental education that strengthens the competence is solution-centered and encourages children and youth to act as active and committed citizens on environmental issues. Research data was collected in the form of interviews at the university’s Researchers of the future science camp. The study showed that for many participants of the science camps, their belief in their own possibilities to influence was most weak concerning the requirements of the action competence. They were interested in having an influence on the issues of plastic garbage, the condition of the Baltic Sea, conditions of animals and the degree of contamination. If children’s action competence concerning environmental issues can be strengthened, instead of becoming distressed and passive about environmental problems, we can strengthen children’s willingness and ability to act in order to come up with a solution to the problem.12 The aim is to utilize the results in planning future science education implementations, and also in further research. One central research topic of science education at the university is the so-called family science education. How can we support children’s and youth’s great future together with close relatives? What kind of a role can drama (using role models and stories) have in inspiring children in hands-on science education? During this summer’s science camps (the application period starts at the beginning of April, see science education’s website for further information2), one object of research is the collaborative science education of grandchildren and grandparents. International collaboration on this topic has also started. Research on science education has an important role in strengthening science education in Finland and globally. Together towards a great future! The writer, Professor Maija Aksela, has carried out science education and its research with her team since 2003 at the University of Helsinki. Since 2010, she has acted as the Director of science education operations at the university. She has written on the importance of science education also previously13,14. Altogether she has more than 30 years of experience on science education and she has written more than 300 publications. Maija Aksela has also been the Director of the LUMA Centre Finland network since 2014. 1 Aksela, M., Oikkonen, J., & Halonen, J. (2018). Collaborative Science Education at the University of Helsinki since 2003: New solutions and pedagogical innovations for teaching from early childhood education to universities. Helsinki: University of Helsinki. 3 Aksela, M. (2019). Promoting math, science and technology education collaboratively through design-based research. It will be published on March 2019 in the book of Contemporary approaches to research in mathematics, science, health and environmental education symposium, Deakin University, Australia. 4 Tolppanen, S. (2015). Creating a Better World : Questions, Actions and Expectations of International Students on Sustainable Development and Its Education. A doctoral dissertation. Helsinki: University of Helsinki. 5 Ikävalko, V.-M. (2017). Mielekkään kemian non-formaalin oppimisympäristön kehittämistutkimus yhteistyössä työelämän kanssa. A doctoral dissertation. Helsinki: University of Helsinki. 7 Merenheimo, S. (2018). Tiedekasvatus: Lasten ja nuorten tutkijakuva – käsityksiä tutkijoista ja heidän työstään. Master’s thesis. Helsinki: University of Helsinki. 8 Ikävalko, T. (2018). Lukion ja yliopiston yhteiskurssin relevanssi lukiolaisen ja yliopisto-opiskelijan näkökulmasta – Tapaustutkimus Globaalit haasteet -kurssilta. Master’s thesis. Helsinki: University of Helsinki. 9 Halonen, J. (2017). Non-formaali tiedekasvatus: Tiedeleirien relevanssi lasten ja perheiden näkökulmasta. Master’s thesis. Helsinki: University of Helsinki. 10 Blomgren, P. (2018). Kemian non-formaalin oppimisympäristön relevanssi oppilaiden ja opettajien näkökulmista. Master’s thesis. Helsinki: University of Helsinki. 12 Aalto, M. (2019). Tiedeleiriläisten toimintakompetenssin kokemukset ympäristökysymyksissä. Master’s thesis. Helsinki: University of Helsinki. 13 Aksela, M. (2012). Tiedekasvatus ja sen tulevaisuus. Tieteessä tapahtuu 4/2012. 14 Aksela, M. (2017). Lasten ja nuorten tieteestä innostuminen vahvistaa Suomen hyvää tulevaisuutta. Tietysti.fi. Science education is defined as the strengthening of scientific knowhow as it covers all fields of science. The University of Helsinki has carried out research-based science education systematically and collaboratively since 2003. The aim of science education is to inspire children and youth – makers of the future – towards studying science together with their close relatives and various collaborative partners, and to support current and future teachers’ important, lifelong learning from early childhood education to universities, and to develop new solutions and pedagogical innovations into education, collaboratively and based on research. Science education is promoted at the University in different faculties and institutes. The operations are a part of teaching, research and societal as well as global interaction at the University. The latest research on different fields of science and on education of them, as well as the processing and dissemination of the knowledge, is in the core of science education operations. The aim of this blog is to bring forth current issues of science education as well as the new innovations and needs for it from various viewpoints. The blog posts are written by researchers, developers and friends of science education as well as by representatives of the collaboration partners.